I first saw the Chameleon ColorTones markers at CHA 2014 last January- and after a long wait, they are finally coming to America! (They’ve been available in the UK for awhile now.) I do love a good alcohol marker- they are a “secret weapon” in the craft room- and I was excited to give these a go. The 22-Pen Deluxe Set is the feature pack of the Chameleon Color Tones Product Line,giving you the full range of markers, plus a Detail and Toning pen. The easy to read deluxe instructions, with useful hints, tip sand techniques complete the set. Nice sturdy storage box also has a flip-top lid that elevates the markers off of you work surface. Each Pen is labeled on the top and bottom. And each has it’s own blending chamber. The detail pen (which is compatible with the inks) has two sizes for bold and fine drawing. And the colorless blender ALSO has a bullet and a brush tip. So actually, each pen is comprised of the marker with two nibs and one blending chamber- that’s why they are so long. 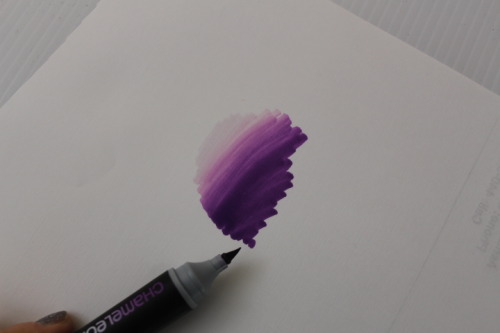 To create a gradation of color, you snap the blending chamber on to the nib of your choice. Then invert so the blending chamber so that the blending solution drains onto the tip of the marker, effectively diluting the color. Wait 10-15 seconds, then begin coloring. You’ll find that the solutions starts out very light, and as you work it will blend out to the marker’s full-strength color. This was a 10-second “fuse” as they call it. I liked the tips just fine- and the colors full-strength were great. I tried the pens with various stamping inks, and found most of them to work just fine. I like the VersaFine best. Yes, I was having a glass of wine while coloring different items! Because the Chameleon Color Tones Pens have alcohol ink in them, you can color shiny surfaces like pearls, rhinestones, vellum, and even metal accents to customize them. I found the Chameleon Color Tones Pens most handy for small images where I could color the area in one go- for example the butterfly above. If you had to “match” that same blend for larger images, you would be hard-pressed to do so. So the Chameleon pens really are for smaller images in my humble opinion. Here’s a video for you, if you’d like to see the marker in action! So here’s my take- these won’t be for everyone- especially folks who have already invested a small fortune in markers from another brand. But if you are just getting started and color blending intimidates you, this is an excellent starter set and would be a lovely gift idea. The price is $99 USD and for 20 color markers and a blending and detail pen, that’s actually less than some other brands- plus you will save money by not needing to by EVERY color tone under the sun. Now, are refillable, but for the new or occasional crafter, they probably don’t need to be. But it’s nice option. Very clever design but given that you mix in the diluter and it fades out, I’d definitely agree these are for smaller areas. Still, if that’s the bulk of what you color, these look like a great alternative to those “other” markers. Actually I put it on hold so I could add the Chameleons into the comparison! Hoping to get that done by December 1.
where can i buy this product, is there a web shop? These will be available on January 16 2015 on Amazon! I’ve included a link for you.